Austin Metblogs » What’s with the white stuff? What’s with the white stuff? The last “hard” snow that I remember actually having to drive in was something like February of ’97ish, when I slid my way to the nearest Walgreen’s to snap some disposable pictures for posterity (which have since been lost). There have been a few flurries since, but seldom anything that stays around for more than an hour, not counting the artificial crap they blow out at First Night. What are your memories of snow in Austin? Snow should put the last nail in the coffin on a day that was pretty well already shut down. On my way to work this morning, there was hardly anyone on the road. 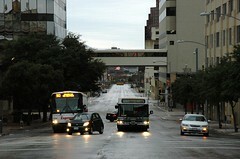 Buses and assorted cars were stuck at 7th and Lavaca, starkly demonstrating the elevation changes that are so easily forgotten in dry conditions. I got to help a lady cross the street, fulfilling my long overdue commitment from Cub Scouts. Most businesses were closed in the ‘hood along S. Lamar, with some notable exceptions including Casita Taco, Kerbey Lane, and Maria’s Taco XPress, proving (yet again) that breakfast tacos and buttermilk pancakes are the fuel that drives Austin. Bless those folks for priming the pumps this morning. Valentine’s Day 2004 was the last snow I remember in South Austin. It melted almost as the sun came up so I don’t think it caused much traffic problems. I think it’s hilarious how Austin is shutting down with the wee amount of ice… I am up on the KS border and we are driving around on 2-3 inches of ice, and 4 inches of snow. Schools had ONE (1) day off from school… Does Austin have the week off? It does border on the comical since conditions and roads seldom get as bad as portrayed by the local news types, who treat ice storms like their Wolf Blitzer-meets-scud-missle moment of staring into the face of danger. And of course it’s nothing compared to what folks up north have to deal with, but then Kelso had a pretty amusing take on that in yesterday’s paper. Essentially: of course we can’t drive on ice, so leave us be when we slide off the road and try to use Ruby’s BBQ sauce to gain traction.